Glass walls and frameless sliding glass doors enhance aesthetics and increase the value of your home.This changes the personality of your property, enhancing the modern feel and showing your passion for interior design. These characteristics impress both guests and potential buyers, while increasing comfort for you and your family. Solid walls block light from traveling through your home, increasing your reliance on artificial on light sources. Allowing the maximum amount of sunlight to reach every corner changes the atmosphere of your home, making it more welcoming and friendly. It is even possible to find glass with UV protection, which allows the same amount of light to enter your home without the damaging effects of UV rays. Frameless glass walls increase natural light best and they pair perfectly with blinds, giving you the option to darken rooms or create privacy. You work hard to have the most beautiful landscape possible. However, it may go unnoticed if it’s hidden behind a wall, unless you make a point of showing visitors. Ensure that your garden is the first thing guests notice, without any effort on your part, by using glass walls to make your backyard part of your home design. A large glass wall without frames that obscure the panorama is by far your top option. Great views are not just for your guests. With a glass wall, every day you’ll wake up to a stunning view. This will help you feel relaxed and inspired every morning. Appearances are just part of the personality of your home. You also need to focus on how your home makes people feel. Improving airflow will avoid your home becoming stuffy and bring cleansing air into every room. Without even stepping outside, you’ll receive all the benefits of natural world. You’ll experience improved physical health (reduced blood pressure and muscle tension) and mental health (prevention of stress and anxiety). Whenever you want fresh air, you just need to slide open your glass panels. You’ll only need to keep the window open for a few minutes before your entire home is refreshed. This is particularly ideal for the winter months, when it can become uncomfortable to leave windows open for extended periods of time. Opening up a space in your home is more convenient for entertaining. When your guests arrive, they’ll see immediately that your home is made for get-togethers. If you’re hosting a large gathering, sliding open interior glass walls will create a large space with plenty of room for everyone. If you’re throwing an outdoor party, such as a summer barbecue, patio doors will give guests easy access to the interior. Plus, you’ll be able to carry tables, couches, and other large items outside without the risk of damage to furniture or dents to the wall. Glass walls are equally useful when holding a more intimate dinner party. It can feel awkward to have a get-together in a space that’s too large. Interior glass walls can close the space to the right size, while retaining a sophisticated appearance in your home. A closed space with too many solid walls and doors sends the message that you’re secretive. If you want to communicate honesty and openness with your home, literal transparency is crucial. The right type of glass will improve the energy efficiency of your home, reducing your utility bills and showing that you care about the environment. Double panes and Low-E windows reduce energy usage by keeping warm air locked in during the winter and preventing the sun from heating up your home during the summer. Sliding glass doors to your backyard can feature a child lock system. This tends to be much more secure than the locks on regular doors. Such a system is critical if you have a pool. Even if you don’t have young kids, this will serve as a key selling point to potential buyers looking for peace of mind. Similarly, interior glass walls show your concern for child safety. They allow you to split a large space into separate areas for kids to play undisturbed. You can then focus on your own activities but still keep an eye on your children. Just as sliding glass doors are more secure under kids’ inquisitive hands, they are better at keeping your family and belongings safe from a break than regular doors. You’ll show burglars that you’re a force to be reckoned with — that your home is protected using the latest technology. Sliding glass doors feature seals and gaskets to keep them shut tight along with mechanisms to stop anyone from lifting the panels off their tracks. Glass creates a sense of a larger space, just like mirrors. Frameless glass works best of all for this purpose. 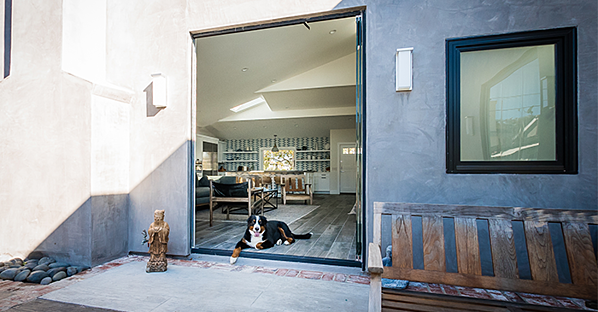 In the case of sliding glass doors, glass actually does create space — as there’s no need to design for a door swinging open on its hinge. You can even extend your furniture into the far corners of the room, if you wish. Whether your home is a moderate size or in fact quite large, you can take advantage of this characteristic. Homes decorated in contemporary style tend to feature at least some glass. Not only does this mean that glass walls and sliding doors will likely match your current style, they will also further emphasize the modernity of your home. You can use glass to portray the exact image you want by choosing the style of panes and the tint of glass. 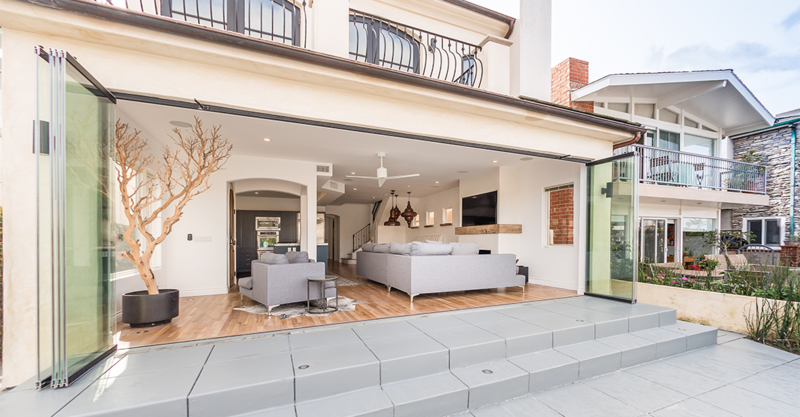 Whether you use glass walls to create a flexible space or install sliding glass doors to improve the connection between the interior and backyard, glass panels will develop the personality of your home. To gain the most from your panes and create a sleek, seamless appearance, choose frameless glass.